Food Safety: Emerging Issues, Technologies and Systems offers a systems approach to learning how to understand and address some of the major complex issues that have emerged in the food industry. 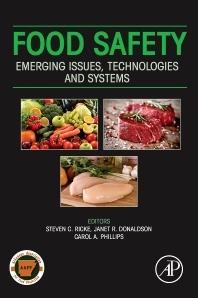 The book is broad in coverage and provides a foundation for a practical understanding in food safety initiatives and safety rules, how to deal with whole-chain traceability issues, handling complex computer systems and data, foodborne pathogen detection, production and processing compliance issues, safety education, and more. Recent scientific industry developments are written by experts in the field and explained in a manner to improve awareness, education and communication of these issues. 2 How Does a Food Manufacturer Begin the Process of Becoming GFSI Certified? 4 Is GFSI Creating a Safer Food Supply? 5 Does GFSI Reduce the Number of Audits a Food Manufacturer Must Undergo? 6 What Are the Thresholds That GFSI Must Overcome to Achieve Even More Widespread Acceptance? 7 How Is GFSI Evolving? 3 Tracking Foodborne Pathogens: What and Where to Target? 6 Conclusions and Future Directions: Where Do We Go from Here? Chapter 10: Shiga Toxin-Producing E. coli and Ruminant Diets: A Match Made in Heaven? Chapter 12: Arcobacter Species: An Emerged or Emerging Pathogen? 5 Sources of Cronobacter spp. Chapter 15: Food Safety at Farmers’ Markets: Fact or Fiction? 3 Traditional Microbiology Training: A Role for Food Microbiology?